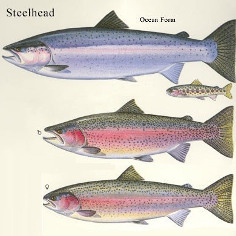 On this page you’ll get the ability to educate yourself on steelheads and steelhead fishing. It doesn’t matter if you’ve been fishing for years or if you’ve only finished once or twice as a child, there are tips that will be useful to you on this page. We first start by educating you about steelheads and we then provide you with some of the best steelhead fishing tips. 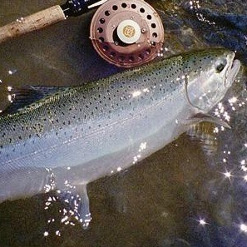 You can also view the steelhead all-time record, facts about steelheads and other useful resources. We hope the information on this page makes you a more effective angler and helps you land some monster steelheads. Steelhead (oncorhynchus mykiss), also more commonly known as rainbow trout, are a freshwater and saltwater species of fish. They will spend 2 to 3 years out at sea and return to freshwater to spawn. They are native to tributaries of Asia, North America and the Pacific Ocean and have been introduced to over 45 different countries as a game fish. They are on every continent except Antarctica. Steelheads are predators and will feed on virtually any type of fish they can catch. As juveniles they feed on aquatic insects, crayfish, crustaceans, eggs of other fish and small fish that are less than a third of their length. As they become adults they start to consume more fish than any other food source. We’ve searched high and low for the best fishing tips for steelheads and hope they help you become a more efficient angler. Artificial Lures Work – There are a variety of different artificial lures that are effective in catching steelhead. It usually comes down to personal preference, but we recommend the Panther Martin UV Spinner. Break out the Eggs – Steelhead consider fish egg sacs to be delicacies and during spawning periods they will be honing in on this tasty meal. While this is a basic live bait it can be very successful in certain locations and at the right time of year. The best part is if you live near an area where they spawn you can get free fish eggs! Just simply harvest, rinse off with water, let them dry for 10 minutes, place in the freezer and only remove them 24 hours before your fishing trip. If you can’t get real eggs then EZ Eggs are your next best option. Are you going to try and break the world record for a caught steelhead with fishing tackle? Good luck, it will be a tough challenge. Below is the current world record for a steelhead according to the International Game Fish Association, also known as the IGFA. The reason it’s listed below as a rainbow trout and not a steelhead is because the trout itself was caught in a land locked lake and couldn’t be classified as a steelhead trout. If you need raw facts about steelhead trout then look no further than below. Our team has put together some basic steelhead facts that are useful to all anglers. It’s vital to remember that some of the below data might be an average and not necessarily represent the top 10% of the bell curve for weight, length, size, etc. You’ve now reached the end of your steelhead educational journey. We hope that the information provided on this page is useful to you. You may want to learn more about steelhead trout and trout fishing in general, so that’s why we put together the below list of additional resources. Hopefully the following resources are useful to you. Steelhead University – This is a great paperback book that is loaded with knowledge on how to become a better steelhead fisherman. The author Terry West has over 37 years of experience catching steelhead and salmon. Trout Legend – Forum – An excellent community of anglers who love to fish for steelhead and all other types of trout. A great place to meet some friends and learn some new tips.